Rebecca Gardner left her heart nearly 3,000 miles from Baton Rouge. She left it in southern Costa Rica, with a group of indigenous women she met five years ago during a visit to see friends doing mission work. The women’s language and lifestyle were starkly different from her own. Each morning, the Guaymi women wake with the sunrise. They start a fire to boil rice for the day. They wash clothes in a stream. Their husbands might head off to work, picking coffee cherries or tending to crops. It’s a simple life, but it’s never easy. Money is a problem. Traveling to the nearest city takes hours, making work inconsistent and hard to find. Discrimination is a problem. Other Costa Ricans ridicule the Guaymi people because they look, talk and dress differently. Nutrition is a problem. Most of the village lives on rice and beans. And just about the only thing that could save the community—education—is perhaps the biggest hurdle of all. The women have elementary-level educations, at best, and struggle to send their own children to school. It’s only a 30-minute walk to the nearest primary school, but in order to attend students need pencils and books, and they are required to wear a uniform. “Sometimes the $40 to buy a uniform—that might as well be a million,” Gardner says. What’s worse, to attend the nearest secondary school the families would have to walk up to three hours each day. Gardner was only 19 when she first met the Guaymi women, but that meeting would change her life forever. Over time, she befriended them and earned their trust. Though they were misunderstood by many, she saw how hard-working they were. And once she started caring about them, she couldn’t stop. To her, donations weren’t the answer. That money would only last so long. She wanted to empower the women to provide for themselves. 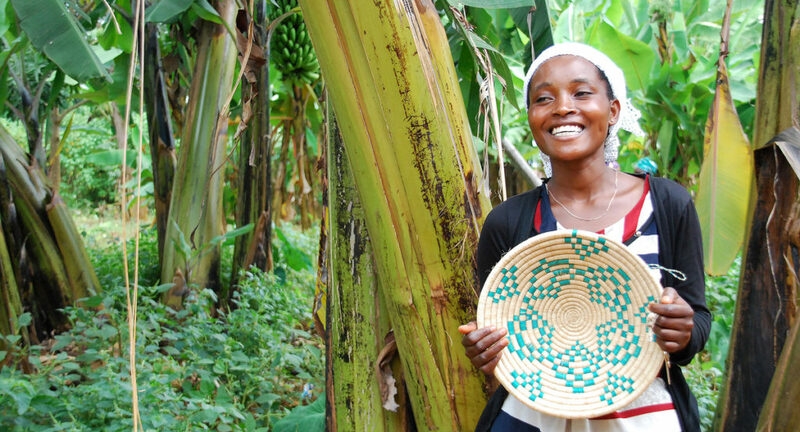 Three years later, she founded Hands Producing Hope, a fair-trade company offering impoverished communities above fair wages in exchange for goods and services. The Guaymi women became her first employees. The women had been making jewelry for years. So Gardner hired 12 of them, ages 16-60, and collaborated with them on designs to sell in the U.S. She helped them source clasps and chains, pick which colors to use, and create fashion-forward designs that would still be unlike anything else on the market. They made necklaces with vibrant Costa Rican seeds and headbands with geometric patterns inspired by Guaymi traditional dresses. Today in her Baton Rouge office, Gardner opens a giant container full of blue paper-bead bracelets, chain necklaces with seed pendants, and colorful cotton headbands. Each one is named for the woman who made it: Yesenia, Amelia, Felicia, Kaia, Sonia, Lena. Since its launch, Hands Producing Hope has grown so much that the women’s jewelry is now sold in 20 boutiques around the country. The containers of jewelry fill an entire bookshelf in Gardner’s home. 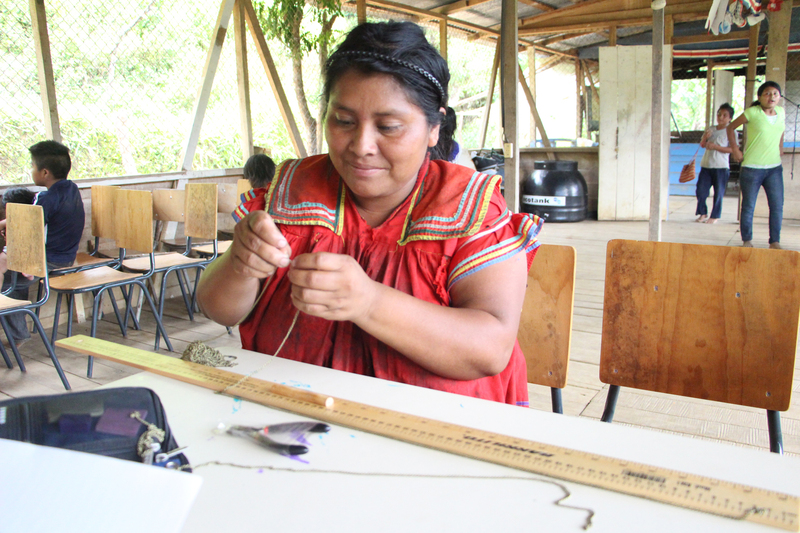 Today, that jewelry is created by 24 women, who can now can afford school supplies for their children. Instead of only eating rice, they can buy tilapia and coffee, which would have otherwise been luxuries for them. Many of the women have gone back to school, even if it means walking three hours each day. Now, Hands Producing Hope is hoping to empower a second community, this one on a remote island that sits on a large lake in western Rwanda. It’s the poorest place in Rwanda, Gardner says. The unemployment rate is at 80%, and starvation is rampant. Some families might only eat two meals per week. Gardner visited the community several times over the past three years to get a deeper understanding of it. 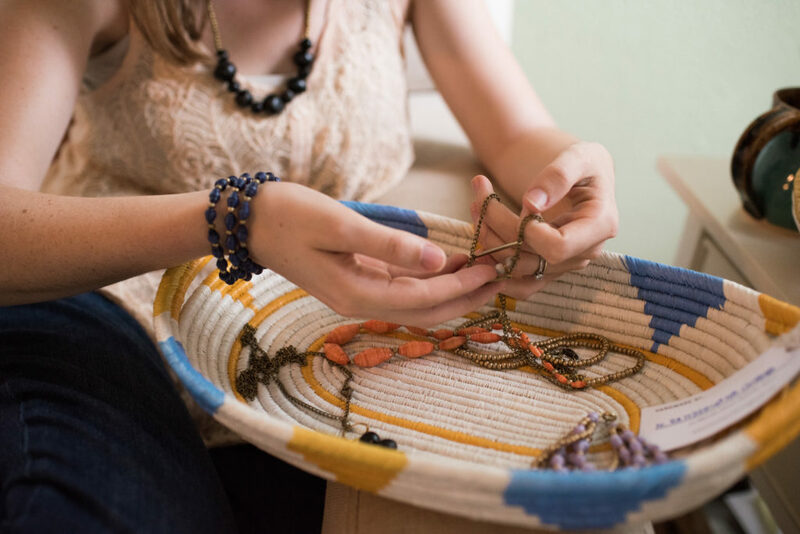 A braided basket by an Rwandan artisan hangs on Gardner’s living room wall. It’s made of dyed grass and recycled materials. 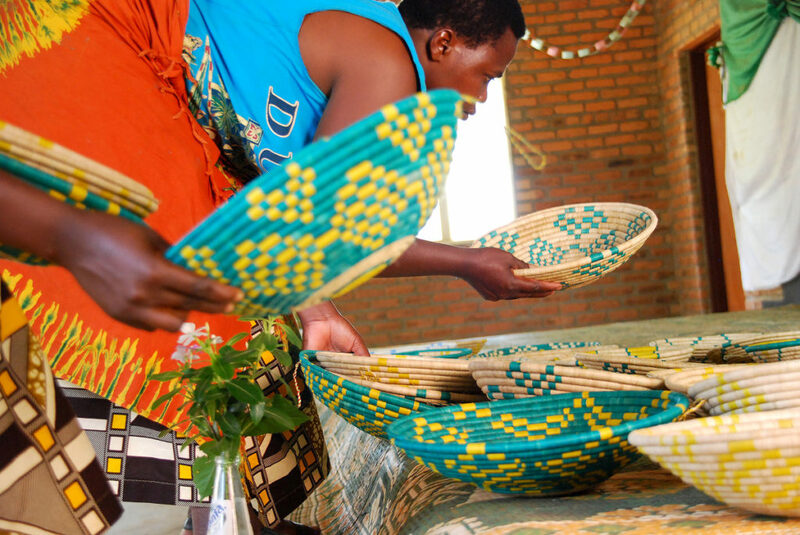 Hands Producing Hope started selling similar baskets made by the local women last month. The organization is also providing reading and writing classes for them, giving the women the chance to learn how to write their own names. 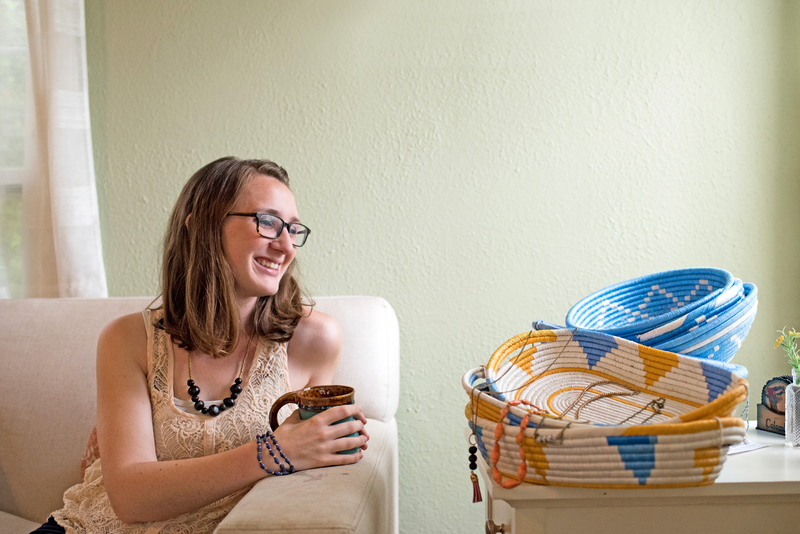 Someday, Gardner hopes to sell handmade bowls, children’s clothing and woven goods from other communities. But her ultimate wish for her company is not to see it grow—she wants the communities to eventually move on, to not need her anymore. She wants them to follow their own dreams, start their own businesses. Priced between $18 and $42, a Hands Producing Hope necklace is not far off from Target prices. It all could happen because someone, somewhere in the U.S. decided to buy a necklace. 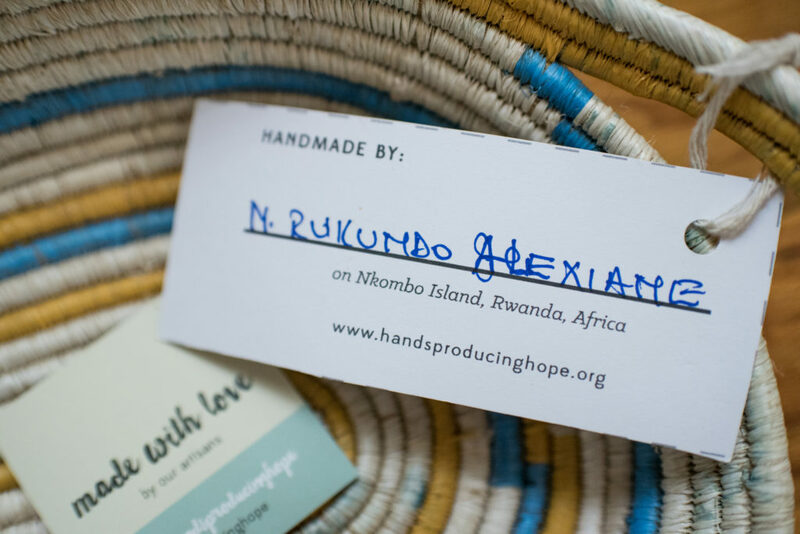 Hands Producing Hope will celebrate the launch of its Rwandan collection July 12, 2017, 6-9:30 p.m., at The Parlor. You can find their products at Southern Sophisticate boutique (7865 Jefferson Highway) and handsproducinghope.org. Find more info about getting involved or get in touch with the organization at its website.